PDQ Cancer Information Summaries [Internet]. Bethesda (MD): National Cancer Institute (US); 2002-. Bethesda (MD): National Cancer Institute (US); 2002-. PDQ Pediatric Treatment Editorial Board. Published online: January 29, 2019. This PDQ cancer information summary for health professionals provides comprehensive, peer-reviewed, evidence-based information about the treatment of childhood ependymoma. It is intended as a resource to inform and assist clinicians who care for cancer patients. It does not provide formal guidelines or recommendations for making health care decisions. Primary brain tumors, including ependymomas, are a diverse group of diseases that together constitute the most common solid tumor of childhood. Immunohistochemical analysis, cytogenetic and molecular genetic findings, and measures of mitotic activity are increasingly used in tumor diagnosis and classification. Brain tumors are classified according to histology, but tumor location and extent of spread are important factors that affect treatment and prognosis. Ependymoma, RELA fusion–positive (WHO Grade II or Grade III). Whether the tumor was completely removed during the initial surgery. Whether the tumor has disseminated throughout the central nervous system. The PDQ childhood brain tumor treatment summaries are organized primarily according to the WHO classification of nervous system tumors. For a full description of the classification of nervous system tumors and a link to the corresponding treatment summary for each type of brain tumor, refer to the PDQ summary on Childhood Brain and Spinal Cord Tumors Treatment Overview. Figure 1. Anatomy of the inside of the brain, showing the pineal and pituitary glands, optic nerve, ventricles (with cerebrospinal fluid shown in blue), and other parts of the brain. The tentorium separates the cerebrum from the cerebellum. 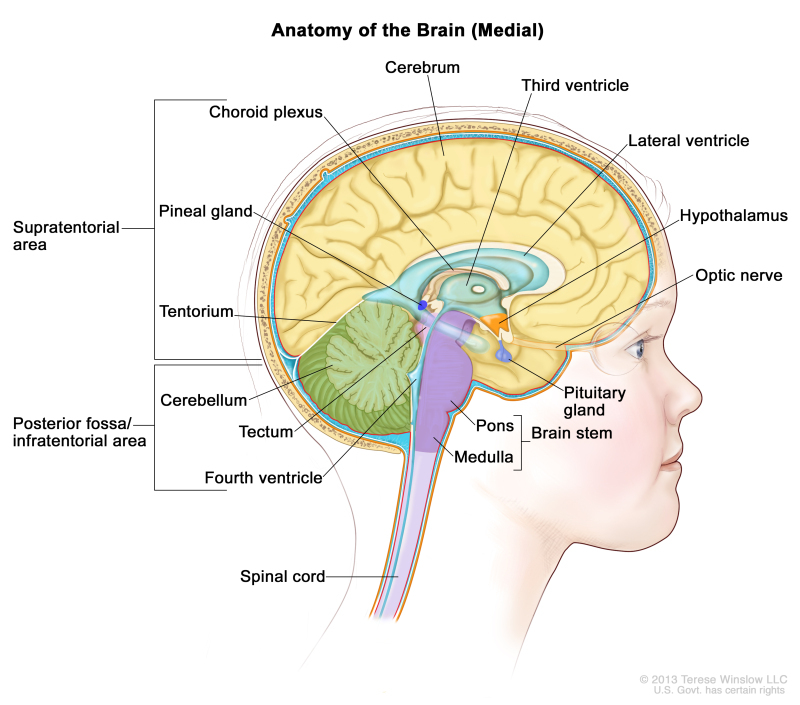 The infratentorium (posterior fossa) is the region below the tentorium that contains the brain stem, cerebellum, and fourth ventricle. The supratentorium is the region above the tentorium and denotes the region that contains the cerebrum. 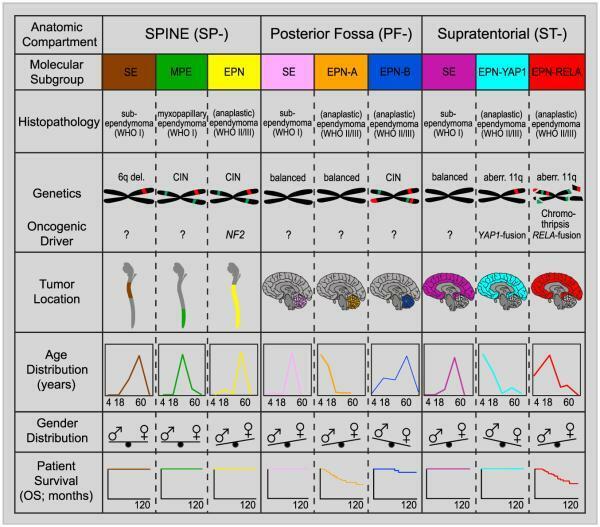 Posterior fossa A, CpG island methylator phenotype (CIMP)-positive ependymoma, termed EPN-PFA. Posterior fossa B, CIMP-negative ependymoma, termed EPN-PFB. C11orf95-RELA–negative and YAP1 fusion–positive ependymoma. Figure 2. Graphical summary of key molecular and clinical characteristics of ependymal tumor subgroups. Schematic representation of key genetic and epigenetic findings in the nine molecular subgroups of ependymal tumors as identified by methylation profiling. CIN, Chromosomal instability. Reprinted from Cancer Cell, Volume 27, Kristian W. Pajtler, Hendrik Witt, Martin Sill, David T.W. Jones, Volker Hovestadt, Fabian Kratochwil, Khalida Wani, Ruth Tatevossian, Chandanamali Punchihewa, Pascal Johann, Juri Reimand, Hans-Jorg Warnatz, Marina Ryzhova, Steve Mack, Vijay Ramaswamy, David Capper, Leonille Schweizer, Laura Sieber, Andrea Wittmann, Zhiqin Huang, Peter van Sluis, Richard Volckmann, Jan Koster, Rogier Versteeg, Daniel Fults, Helen Toledano, Smadar Avigad, Lindsey M. Hoffman, Andrew M. Donson, Nicholas Foreman, Ekkehard Hewer, Karel Zitterbart, Mark Gilbert, Terri S. Armstrong, Nalin Gupta, Jeffrey C. Allen, Matthias A. Karajannis, David Zagzag, Martin Hasselblatt, Andreas E. Kulozik, Olaf Witt, V. Peter Collins, Katja von Hoff, Stefan Rutkowski, Torsten Pietsch, Gary Bader, Marie-Laure Yaspo, Andreas von Deimling, Peter Lichter, Michael D. Taylor, Richard Gilbertson, David W. Ellison, Kenneth Aldape, Andrey Korshunov, Marcel Kool, and Stefan M. Pfister, Molecular Classification of Ependymal Tumors across All CNS Compartments, Histopathological Grades, and Age Groups, Pages 728–743, Copyright (2015), with permission from Elsevier. Approximately two-thirds of childhood ependymomas arise in the posterior fossa, and two major genomically defined subtypes of posterior fossa tumors are recognized. Similarly, most pediatric supratentorial tumors can be categorized into one of two genomic subtypes. These subtypes and their associated clinical characteristics are described below. Among these subtypes, the 2016 World Health Organization (WHO) classification has accepted ependymoma, RELA fusion–positive, as a distinct diagnostic entity. Presentation in young children (median age, 3 years). Low rates of mutations that affect protein structure (approximately five per genome), with no recurring mutations. Figure 3. Identification of Subgroup-Specific Copy Number Alterations in the Posterior Fossa Ependymoma Genome. (A) Copy number profiling of 75 PF ependymomas using 10K array-CGH identifies disparate genetic landscapes between Group A and Group B tumors. Toronto and Heidelberg copy number datasets have been combined and summarized in a heatmap. The heatmap also displays the association of tumors to cytogenetic risk groups 1, 2, and 3 (Korshunov et al., 2010). Statistically significant chromosomal aberrations (black boxes) are also displayed between both subgroups, calculated by Fisher's exact test. Witt H, Mack SC, Ryzhova M, et al. : Delineation of two clinically and molecularly distinct subgroups of posterior fossa ependymoma. Cancer Cell 20 (2): 143-57, 2011, doi:10.1016/j.ccr.2011.07.007. Copyright © 2011 Elsevier Inc. All rights reserved. Presence of the CIMP (i.e., CIMP positive). High rates of disease recurrence (33% progression-free survival [PFS] at 5 years) and low survival rates compared with other subtypes (68% at 5 years). Presentation primarily in adolescents and young adults (median age, 30 years). Absence of the CIMP (i.e., CIMP negative). Favorable outcome in comparison to EPN-PFA, with 5-year PFS of 73% and overall survival (OS) of 100%. Represents approximately 70% of supratentorial ependymomas in children,[9,10] and presents at a median age of 8 years. Presence of C11orf95-RELA fusions resulting from chromothripsis involving chromosome 11q13.1. Evidence of NF-κB pathway activation at the protein and RNA level. Low rates of mutations that affect protein structure and absence of recurring mutations outside of C11orf95-RELA fusions. Presence of homozygous deletions of CDKN2A, a known poor prognostic factor for ependymomas, in approximately 15% of cases. Gain of chromosome 1q, a known poor prognostic factor for ependymomas, in approximately one-quarter of cases. Unfavorable outcome in comparison to other ependymoma subtypes, with 5-year PFS of 29% and OS of 75%. Supratentorial clear cell ependymomas with branching capillaries commonly show the C11orf95-RELA fusion, and one series of 20 patients with a median age of 10.4 years showed a relatively favorable prognosis (5-year PFS of 68% and OS of 72%). Median age at diagnosis of 1.4 years. A relatively stable genome with few chromosomal changes other than the YAP1 fusion. Relatively favorable prognosis (although based on small numbers), with a 5-year PFS of 66% and OS of 100%. The absence of recurring mutations in the EPN-PFA and EPN-PFB subtypes at diagnosis precludes using their genomic profiles to guide therapy. The RELA and YAP1 fusion genes present in supratentorial ependymomas are not directly targetable with agents in the clinic, but can provide leads for future research. The clinical presentation of ependymoma is dependent on tumor location. Infratentorial (posterior fossa) ependymoma: In children, approximately 65% to 75% of ependymomas arise in the posterior fossa. Children with posterior fossa ependymoma may present with signs and symptoms of obstructive hydrocephalus due to obstruction at the level of the fourth ventricle. They may also present with ataxia, neck pain, or cranial nerve palsies. Supratentorial ependymoma: Supratentorial ependymoma may result in headache, seizures, or location-dependent focal neurologic deficits. Spinal cord ependymoma: Spinal cord ependymomas, which are often the myxopapillary variant, tend to cause back pain, lower extremity weakness, and/or bowel and bladder dysfunction. Every patient suspected of having ependymoma is evaluated with diagnostic imaging of the whole brain and spinal cord. The most sensitive method available for evaluating spinal cord subarachnoid metastasis is spinal magnetic resonance imaging (MRI) performed with gadolinium. This is ideally done before surgery to avoid confusion with postoperative blood. If MRI is used, the entire spine is generally imaged in at least two planes with contiguous MRI slices performed after gadolinium enhancement. If feasible, CSF cytological evaluation is conducted. In contrast, EPN-PFB occurs primarily in older children and adults and is characterized by a more favorable prognosis and by numerous cytogenetic abnormalities involving whole chromosomes or chromosomal arms. Immunohistochemical testing has identified increased expression of markers of proliferation (e.g., Ki-67 and MIB-1) [35,36] and increased expression of EZH2, a polycomb complex protein involved in epigenetic regulation of gene expression, as prognostic factors for greater risk of treatment failure. Surveillance neuroimaging, coupled with clinical assessments, are generally recommended after treatment for ependymoma. The frequency and duration have been arbitrarily determined and the utility is uncertain. Most practitioners obtain MRI imaging of the brain and/or spinal cord every 3 months for the first 1 to 2 years after treatment. After 2 years, imaging every 6 months for the next 3 years is often undertaken. Louis DN, Ohgaki H, Wiestler OD: WHO Classification of Tumours of the Central Nervous System. 4th rev.ed. Lyon, France: IARC Press, 2016. Gurney JG, Smith MA, Bunin GR: CNS and miscellaneous intracranial and intraspinal neoplasms. In: Ries LA, Smith MA, Gurney JG, et al., eds. : Cancer incidence and survival among children and adolescents: United States SEER Program 1975-1995. Bethesda, Md: National Cancer Institute, SEER Program, 1999. NIH Pub.No. 99-4649, Chapter 3, pp 51-63. Also available online. Last accessed October 12, 2018. Central Brain Tumor Registry of the United States: Statistical Report: Primary Brain Tumors in the United States, 1997-2001. Hinsdale, Ill: Central Brain Tumor Registry of the United States, 2004. Also available online. Last accessed October 12, 2018. For the first time, the 2016 World Health Organization (WHO) Classification of Tumors of the Central Nervous System (CNS) incorporates the addition of genotypic findings in the classification of select CNS tumors. This integrated classification is intended to define more homogeneous entities that will improve the accuracy of diagnoses, refine prognoses, and more reliably reach conclusions regarding treatment strategies. Subependymoma (WHO Grade I): A subependymoma is a slow-growing neoplasm, typically attached to the ventricle wall and is composed of glial tumor cell clusters embedded in a fibrillary matrix. The true incidence of subependymomas (WHO Grade I) is difficult to determine. These tumors are frequently asymptomatic and may be found incidentally at autopsy. Subependymomas probably comprise less than 5% of all ependymal tumors. Myxopapillary ependymoma (WHO Grade I): A myxopapillary ependymoma arises almost exclusively in the location of the conus medullaris, cauda equina, and filum terminale of the spinal cord and is characterized histologically by tumor cells arranged in a papillary manner around vascularized myxoid stromal cores. Papillary ependymoma—forms linear, epithelial-like surfaces along cerebrospinal fluid exposures. Clear cell ependymoma—displays an oligodendroglial-like appearance with perinuclear halos; this variant is preferentially located in the supratentorial compartment of the brain. Tanycytic ependymoma—the rarest form of Grade II ependymoma; this subtype is most commonly found in the spinal cord; tumor cells are arranged in fascicles of variable width and cell density and are poorly intertwined. Ependymoma, RELA fusion–positive (WHO Grade II or Grade III): This integrated diagnosis is seen in most supratentorial ependymal tumors in children. Phenotypically, it is similar to ependymoma (WHO Grade II) or anaplastic ependymoma (WHO Grade III). These tumors are characterized by a C11orf95-RELA fusion, and L1CAM immunohistochemistry may serve as a surrogate for this subtype. Anaplastic ependymoma (WHO Grade III): Also known as malignant ependymoma. An anaplastic ependymoma is considered a malignant glioma of ependymal differentiation and, compared with the Grade II ependymomas, shows increased cellularity and increased mitotic activity, often associated with microvascular proliferation and necrosis. Subependymomas and myxopapillary ependymomas are usually considered to be clinically and pathologically distinct from the Grade II and Grade III ependymomas. Although supratentorial and infratentorial ependymomas are believed to arise from radial glia cells, they have different genomic, gene expression, and immunohistochemical signatures. [3-5] Supratentorial tumors are more often characterized by neuronal differentiation. Ependymoblastoma is no longer recognized in the WHO classification and is now classified as an embryonal tumor with multilayered rosettes. The pathologic classification of pediatric brain tumors is a specialized area that is evolving; review of the diagnostic tissue by a neuropathologist who has particular expertise in this area is strongly recommended. Although there is no formal staging system, ependymomas can be divided into supratentorial, infratentorial, and spinal tumors. Approximately 30% of childhood ependymomas arise in supratentorial regions of the brain and 70% arise in the posterior fossa. They usually originate in the ependymal linings of ventricles or central canal or ventriculus terminalis of the spinal cord and have access to the cerebrospinal fluid. Therefore, these tumors may spread throughout the neuraxis, although dissemination is noted in less than 10% of patients with Grade II and Grade III ependymomas. Myxopapillary ependymomas are more likely to disseminate to the nervous system early in the course of illness. Many of the improvements in survival in childhood cancer have been made as a result of clinical trials that have attempted to improve on the best available, accepted therapy. Clinical trials in pediatrics are designed to compare new therapy with therapy that is currently accepted as standard. This comparison may be done in a randomized study of two treatment arms or by evaluating a single new treatment and comparing the results with those previously obtained with existing therapy. Because of the relative rarity of cancer in children, all patients with aggressive brain tumors should be considered for entry into a clinical trial. To determine and implement optimum treatment, treatment planning by a multidisciplinary team of cancer specialists who have experience treating childhood brain tumors is required. Radiation therapy of pediatric brain tumors is technically demanding and should be performed in centers that have experience in that area to ensure optimal results. Table 1 describes the standard treatment options for newly diagnosed and recurrent childhood ependymoma. Subependymomas are exceedingly rare in children and approaches to treatment have been inferred from the experience in the adult population. In cases requiring therapy, complete surgical removal is often curative. Some subependymomas are considered incidental findings and observed without intervention. Occasionally, subependymomas cause ventricular obstruction and, in these cases, ventriculoperitoneal shunt placement is indicated. Spontaneous intratumoral hemorrhage has also been observed. Surgery with or without adjuvant radiation therapy. Treatment options for no residual disease, no disseminated disease. Treatment options for residual disease, no disseminated disease. Treatment options for central nervous system (CNS) disseminated disease. Treatment options for children younger than 3 years. Typically, all patients undergo surgery to remove the tumor. Whether additional treatment is given depends on the extent of tumor resection and whether there is disseminated disease. Surgery is performed in an attempt at maximal tumor reduction. Evidence suggests that more extensive surgical resection is related to an improved rate of survival. [1-5]; [6,7][Level of evidence: 3iDii] Magnetic resonance imaging (MRI) is performed postoperatively to confirm the extent of resection. If not performed preoperatively, MRI of the entire neuraxis to evaluate disease dissemination and cerebrospinal fluid cytopathology is performed. Patients with residual tumor or disseminated disease should be considered at high risk of relapse and may be treated on protocols specifically designed for them. Those with no evidence of residual tumor still have an approximate 20% to 40% relapse risk in spite of postoperative radiation therapy. Retrospective analysis of the outcome for patients with posterior fossa ependymoma (EPN-PFB) suggests that these patients might be sufficiently treated with gross-total resection alone, but this approach has not been tested in a prospective, randomized clinical trial. The traditional postsurgical treatment for these patients has been radiation therapy consisting of 54 Gy to 59.4 Gy to the tumor bed for children aged 3 years and older. [5,13] It is not necessary to treat the entire CNS (whole brain and spine) because these tumors usually recur initially at the local site. ; [Level of evidence: 3iiiA] When possible, patients should be treated in a center experienced with the delivery of highly conformal radiation therapy (including intensity-modulated radiation therapy or charged-particle radiation therapy) to pediatric patients with brain tumors. In one study, 74 patients aged 1 to 21 years were treated with conformal radiation therapy after surgery. The 3-year progression-free survival (PFS) rate was 77.6% ± 5.8%. The 7-year event-free survival was 76.9% ± 13.5%. Focal radiation therapy has been used in certain cases. In a small series of children with localized ependymoma, surgery alone was compared with adjuvant radiation therapy. Adjuvant radiation therapy appeared to improve PFS, even after adjusting for the extent of resection. In fact, a PFS benefit was observed for patients who received adjuvant radiation therapy after gross-total resection, compared with those who did not receive radiation therapy. Additional research will be necessary to confirm these findings. There is no evidence to date that adjuvant chemotherapy, including the use of myeloablative chemotherapy, improves the outcome for patients with totally resected, nondisseminated ependymoma. For this reason, current treatment approaches do not include chemotherapy as a standard component of primary therapy for children with newly diagnosed ependymomas that are completely resected. A randomized trial evaluating the efficacy of postradiation chemotherapy in children who have had a gross-total resection is under way. Second-look surgery should be considered because patients who have complete resections have better disease control. In some cases, further surgery can be undertaken after the initial attempted resection if the pediatric neurosurgeon believes that a gross-total resection could be obtained by an alternate surgical approach to the tumor. In other cases, further up-front surgery is not anticipated to result in a gross-total resection, therefore, adjuvant therapy is initiated with future consideration of second-look surgery. The rationale for radiation therapy as described in the Treatment options for no residual disease, no disseminated disease subsection above also pertains to the treatment of children with residual, nondisseminated ependymoma. In patients with a subtotal resection, treatment with radiation therapy results in 3-year to 5-year PFS in 30% to 50% of patients, although the outcome for patients with residual tumor within the spinal canal may be better. One study demonstrated a benefit of preirradiation chemotherapy in children with near-total resection (>90% resection), with outcomes similar to children achieving a gross-total resection followed by radiation therapy. The Children’s Oncology Group (COG) has completed a study of preirradiation chemotherapy in children with residual disease after up-front surgery to determine whether children treated with chemotherapy can achieve a complete response with chemotherapy or second-look surgery. Results are pending. Regardless of the degree of surgical resection, these patients generally receive radiation therapy to the whole brain and spine, along with boosts to local disease and bulk areas of disseminated disease. The traditional local postsurgical radiation doses in these patients have been 54 Gy to 55.8 Gy. Doses of approximately 36 Gy to the entire neuraxis (i.e., the whole brain and spine) are also administered but may be modulated depending on the age of the patient. Boosts between 41.4 Gy and 50.4 Gy to bulk areas of spinal disease are administered, with doses depending on the age of the patient and the location of the tumor. However, there are no contemporary studies published to support this approach. The role of chemotherapy in the management of children with disseminated ependymoma is unproven. Historically, postoperative radiation therapy was omitted for children younger than 3 years with ependymoma. The previous two COG studies have lowered the age limit for postoperative radiation therapy to age 1 year in an effort to improve outcomes for these younger children. The first of these two studies (ACNS0121 [NCT00027846]) is awaiting publication to provide evidence of the utility of this approach. Retrospective reviews based on Surveillance, Epidemiology, and End Results data of children younger than 3 years at diagnosis were accrued over a 50-year period. Results showed that patients who received local radiation therapy had better 10-year survival rates, even after adjusting for extent of resection and tumor grade (grade 2 vs. grade 3). Conformal radiation therapy is an alternative approach for minimizing radiation-induced neurologic damage in young children with ependymoma. The need and timing of radiation therapy for children who have successfully completed chemotherapy and have no residual disease is still to be determined. The initial experience with this approach suggested that children younger than 3 years with ependymoma have neurologic deficits at diagnosis that improve with time after conformal radiation treatment. Conformal radiation approaches, such as 3-dimensional conformal radiation therapy, that minimize damage to normal brain tissue and charged-particle radiation therapy, such as proton-beam therapy, are under evaluation for infants and children with ependymoma. [16,38] When analyzing neurologic outcome after treatment of young children with ependymoma, it is important to consider that not all long-term deficits can be ascribed to radiation therapy because deficits may be present in young children before therapy begins. For example, the presence of hydrocephalus at diagnosis is associated with lower intelligence quotient as measured after surgical resection and before administration of radiation therapy. The recently closed COG protocol (ACNS0121 [NCT00027846]) for children with ependymoma includes children aged 1 year and older. The trial is a prospective evaluation of postoperative radiation therapy. Results are forthcoming. Early-phase therapeutic trials may be available for selected patients. These trials may be available via the COG, the Pediatric Brain Tumor Consortium, or other entities. Information about National Cancer Institute (NCI)–supported clinical trials can be found on the NCI website. For information about clinical trials sponsored by other organizations, refer to the ClinicalTrials.gov website. The trial will determine whether adding chemotherapy after radiation therapy results in improved survival over radiation therapy alone. The trial will determine whether children with supratentorial nonanaplastic ependymoma who receive a complete resection or who achieve a complete remission after being treated with chemotherapy can be successfully treated without radiation therapy. The trial will determine whether adding chemotherapy before and after radiation therapy results in improved survival compared with previous studies of children who did not receive additional chemotherapy after radiation treatment. Recurrence is not uncommon for all grades of ependymoma and may develop many years after initial treatment. Late recurrence beyond 10 to 15 years has been reported. Disease generally recurs at the primary tumor site, although concomitant neuraxis dissemination may also be seen. Systemic relapse is extremely rare. At time of relapse, a complete evaluation for extent of recurrence is indicated for all patients. Length of time between initial treatment and the reappearance of the recurrent lesion. In some cases, surgically accessible lesions may be treated alternatively by radiation therapy. Active anticancer agents, including cyclophosphamide, cisplatin, carboplatin, lomustine, and etoposide. Regardless of treatment strategy, the prognosis for patients with recurrence is poor. Entry into studies of novel therapeutic approaches should be considered. Early-phase therapeutic trials may be available for selected patients. These trials may be available via the Children's Oncology Group (COG), the Pediatric Brain Tumor Consortium, or other entities. Information about National Cancer Institute (NCI)–supported clinical trials can be found on the NCI website. For information about clinical trials sponsored by other organizations, refer to the ClinicalTrials.gov website. Revised text to state that the 3-year progression-free survival (PFS) rate for children treated with proton-beam radiation therapy was 76% in two series and appears to be similar to the PFS rate for children treated with intensity-modulated photon-beam radiation therapy. Also added text to state that in the two series that used proton-beam radiation therapy, the 3-year local control rates were 83% to 85%, with overall survival rates of 90% to 95% (cited Indelicato et al. as reference 19). PDQ Pediatric Treatment Editorial Board. Childhood Ependymoma Treatment (PDQ®): Health Professional Version. 2019 Jan 29. In: PDQ Cancer Information Summaries [Internet]. Bethesda (MD): National Cancer Institute (US); 2002-.